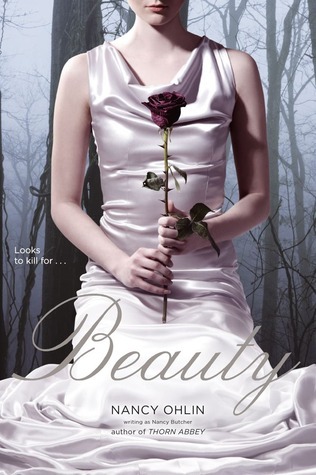 Review: What is beauty really? Is it smooth skin, fabulous bone structure, silky hair and bright eyes? Is makeup an essential part of beauty? And above all — what is beauty worth? These are some of the questions that came up for me throughout this fairy tale retelling. Initially when I saw the title, I thought maybe this was a Beauty and the Beast story, but instead, the book is a Snow White story and centers on the importance placed on beauty. Some of my favorite novels are retellings of fairy tales. Retellings are often excellent because original fairy tales often have very flat characters and are mostly about the plot. Novels allow plenty of time and space for readers to get to know the characters well and see new aspects of the old tales. They feel familiar, but not boring and worn out, since authors add their own twists to the story or think up unique explanations for events. In Beauty, Ohlin focuses quite a bit on the glamorous Queen Veda. She doesn’t have a mirror on the wall, but does have a beauty consultant who is an audience for her beauty and acts as a mirror. There are several interesting additions to the story (that I won’t share for fear of spoiling them), but I felt that the characters still were not fully formed and developed. We meet Ana and realize that she doesn’t want to outshine her mother, but other than that and her interest in history, we don’t learn all that much about her. Queen Veda is also very one dimensional. Yes, she is hyper focused on beauty, but that is pretty much all we know about her. It would seem that a fully developed character would also have some positives to note. There are no gray areas here and I found myself looking for them in vain. I did appreciate the way the book led me to contemplation of beauty and of war. A standout line is “War is what human beings do to each other when their is no morality left.” This was way more of a thinking book than I had anticipated. I just didn’t feel like I got to know the characters all that well. If fairy tale retellings are your thing, you should borrow it someday, but otherwise, you may want to skip this one. Some other fairy tale retellings I would recommend are Cinder by Marissa Meyer, Ash by Malinda Lo, and Beast by Donna Jo Napoli. Wow. That’s disappointing about the characters. I love a good fairy tale retelling. But the characters are the most important aspect.